Blown Away by Local Generosity! A new Funeral Home opened its doors on 17th May in Hemsworth. 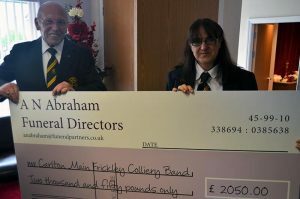 A N Abraham, who also have a sister branch in South Elmsall, have recently held a campaign highlighting the benefits of having a funeral plan and for each plan taken out have donated monies to the Carlton Main Frickley Colliery Band. The band is based in the village of South Elmsall where the sister branch of A N Abraham’s is also and Abraham’s have sponsored the band for the last two years as part of a three year agreement to assist the band following their historic Yorkshire Championships win back in 2015. The sponsorship helped the band to compete in London at the National Championships that year and to help with the financial running of the organisation. The band received a cheque for 2050.00 from Brett and the team at A N Abraham’s at the official opening and dedication of the branch and Chapels of Rest.